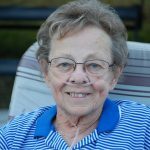 Mary “Marlene” Adams, 81, of Cleburne, Texas, passed away on Tuesday, December 12, 2017. Service: 2:00 p.m., Friday, December 15, 2017, at Martin’s Funeral Home Chapel, Granbury, Texas. Visitation: 6:00 – 8:00 p.m. Thursday at Martin’s Funeral Home. Marlene was welcomed into the home of James and Mable Pardee Langham in Emeigh, Pa on December 1, 1936. She married John “Bobby” Adams in 1954 in Weatherford, Texas. Marlene was an inspector in the automotive industry. She was a hard worker, a great cook and a sweet lady who was loved by many. She loved gardening and could grow the best tomatoes. She always had her hand held solitaire gamer with her and loved playing every chance she got. Marlene was a giving person that loved animals and enjoyed spending time with her family. She was preceded in death by her husband, John R. Adams “Bobby”, her mother Mable Broadwell, father Jim Langham, sister Marion “Mike” Byington and brother Jimmy Langham. Survivors: children Debbie Spurgeon (Rabbit), Sam Adams (Linda), Doris Lemon (John), Nora Taylor (Boo), John Adams (Tanya); grandchildren Laura (Scott), Brenda (Brian), Robbie (Amiee), Greg (Amy), Misty (Dirk), April (Chris), Brandi (Casey), Douglas (Amanda), Joey (Mindy) Shawn, Amanda (Daniel), Tiffani (Michael), Sophie, Deanna, Michael (John) and Greg; numerous great grandchildren; siblings Marsha Smethers, Doc Langham (Dominga), Norman Langham, Danny Langham (Diane), Mike Langham, Charlie Langham (Millie), Billy Broadwell, Timmy Langham (Gaye) and Jimmy Broadwell. Sorry for your loss. We had some great times together with her and the family. We will be praying for all . Sorry that I can't be there. Prayers and Hugs for all. I have the Greatest Cousins. RIP Aunt Marlene.